There was a little bit of agency news this week that made me very happy. Nine years after they dropped it, JWT is reinstating the name J.Walter Thompson. It’s been announced to mark the agency’s 150 year anniversary – the perfect time to celebrate the uniqueness of this once amazing agency. To those saying ‘so what? It’s just a name’, let me explain. Commodore James Walter Thompson was the founder of modern advertising – turning a media sales department into a creative agency and recognizing the importance of the female consumer back in the late 1800s. In 1911, 50 years before Peggy Olsen and her real-life counterparts, he hired the first-ever female creative director. J.Walter Thompson went on to innovate and create for the next 90 years. The quality of their graduate scheme established their reputation as the ‘University of Advertising’. I know, as I was lucky enough to be one. Those of us that worked there back in the late 80s/early 90s were very aware, and very proud, of its tradition and heritage. The pitches were legendary and I still remember the thrill of walking into Berkeley Square to see the blue ‘signature’ flags flying outside number 40, announcing a big win (and the £1 vouchers we were all given to spend in the bar or the in-house shop). 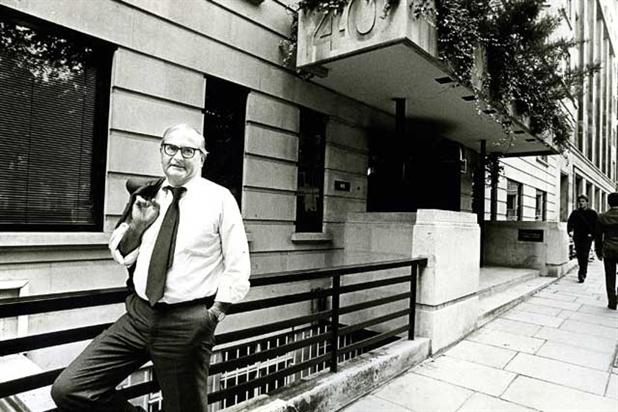 40 Berkeley Square was a London landmark. It was always fun to give the address to a cab driver after a long, boozy lunch (well, it was the 80s) and then spend the journey chatting about the KitKat pandas, the Oxo mum and Beattie, the ‘you got an ology!’ BT grandma. Famous for the building, famous for the work. When they left Berkeley Square (and Hay’s Mews) in early 2002, it was like the ravens leaving The Tower of London. Ditching the full name 3 years later would, I’m sure, have finally made Commodore Thompson turn in his grave. A few years ago, I had a meeting at the new Knightsbridge office, and it just broke my heart to see important bits of their heritage – including the bust of The Commodore, which once proudly sat in the eponymous bar – lying on the floor in a back corridor. J.Walter Thompson had that unique element that many clients would kill for – it was a true heritage brand. It was the agency that INVENTED advertising as we know it. If your response is, ‘agencies aren’t named after founders anymore, grandma’, well maybe that’s because the industry hasn’t seen any true pioneers in a very long while. Names above the door only matter when they’re synonymous with the innovative values of the founder. David Ogilvy, the Saatchi brothers and Bartle, Bogle and especially Hegarty may well have been the last to really embody this. I never saw the logic behind ditching the mother brand in the first place. J.Walter Thompson was always known by both names, as Global Chair & CEO Bob Jeffrey admits, so it always felt like a pointless global branding exercise – discarding years of heritage in favour of faceless corporate efficiency. So if you’re ever in the lofty position of considering a decision like this, please ask yourself these simple questions; Does the current brand really stand for something? Has it been there longer than you? Will it still be there long after you’ve gone? If the answer to these questions is ‘yes’, PLEASE LEAVE WELL ALONE.